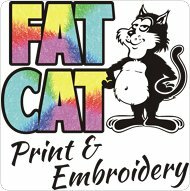 Multi Head Embroidery Machines, Automated Screen Printing, Transfer Printing & The Latest Direct to Garment Technology Make Fat Cat Market Leaders In Decorated Apparell. Our In House Studio Team Works Closely With Clients To Ensure The Best Process is Used To Create The Lasting Impression On Our Garments. Upto Date Embroidery Software Means We Produce All Embroidery Files In House. 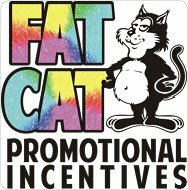 Fat Cat Promo Has a Wealth Of Experience In Promoting A Clients Brand, Event Or Product Launch. So Wether Its A Promotional Pen, A Promotional Umberella Or A Promotional Mug & Promtional Keyrings At Fat Cat Promo We Never Forget Its A Vehicle For Your Brand. And As Brands Are Precious Things, We Only Source Promotional Merchadise Thats Upto the Mark Quality-Wise & Corporate Gifts With The WOW Factor. Using The Latest Roland Versacam Machines We Have The Abilty To Produce High Quality Full Colour Graphics On Eye-Catching Banners & Cost Effective Pop-Up Displays, Ideal For Any Marketing Occassion. 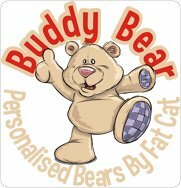 Buddy Bear Is A Unique Range Of Quality Plush Characters Which Can Be Personalised For A Huge Range Of Occasions. All Our Buddy Bears Can Be Embroidered With A Personal Message To Suit Any Occasion. Our Range Of Standard Designs Include Our Popular Birth Block Which is The Perfect Way To Celebrate The Birth Of a New Baby. Other Designs Include Childs First Christmas & Soon To Be Launched Our Valentines & Easter Range. Each Buddy Is Carefully Packaged & Dispatched Within 48 Hours Using Royal Mail Special Delivery Ensuring Your Bear Arrives In Time For That Special Person. All Of Our Bears Are Produced To The Highest Quality Standards & Conform To Toy Safety Regulations. Yorkshire Is The Largest County In The United Kingdom & Everyone Born n Bred In Yorkshire Are Proud Of Their Roots & Are Not Shy Of Telling Everyone Else About 'Gods Own County'. 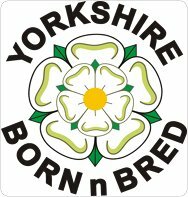 Our Yorkshire Born n Bred Brand Aims To Create A Range Of Products, Gifts & Clothing Which Any True Yorkshireman (or Woman) Would Be Not Ashamed To Have. A Expanding Range Of Clothing Including Polos, Sweats & Jackets Thru To Quirky T-Shirts, Gifts & Humourous Mugs. And Please Remember... Never Ask A Man If He's From Yorkshire! If He Is He'll Tell Ya Anyway. If He's Not You'll Only Embarrass Him.